And so the war ground on, and the crowds at the football matches being played in the London Combination grew smaller and smaller. Quite why this was so I have not been able to find out. Was it because Arsenal were now losing games? That is certainly possible because by the end of November Arsenal’s last nine matches had the result sequence of won one, drawn three, lost five. Or was it because the number of men free to attend games was declining? Certainly at the rate of decline seen in these final months of 1917 it would have looked like there was hardly much point in carrying on. The average attendance during October and November, taking into account both home and away games, was (for Arsenal) 5560. This compares with three consecutive games in September which had an average crowd of over 12,000. And the games in November included matches against Chelsea and Tottenham – the two biggest crowd draws for Arsenal. But it is true that the results didn’t help for after an excellent start to the third wartime season, Arsenal had slipped back significantly and suffered three defeats and two draws in the last five games. Thus the win on 3 November as Arsenal beat Clapton Orient at Highbury 3-1, was very welcome but the crowd of just 3,000 showed how far down the list of entertainments football matches in general and Arsenal in particular had slipped. True, Clapton was never a major attraction, but this was the lowest home crowd of the season. Elsewhere there was not too much in the war news to cheer the hearts. The event from November 1917 now remembered was the fact that on 2 November the Foreign Secretary Arthur Balfour makes the Balfour Declaration proclaiming British support for establishment of a homeland for the Jewish people in Palestine. It would have been highly significant to members of the Jewish faith, but probably did not have much impact on the majority of the population. On 7 November the third battle of Gaza was fought and finally the British forces captured Gaza from the Ottoman Empire. Back home, the London County Council continued to wrestle with the implications of the radical proposed changes to the education that we noted earlier, and Sir Henry Norris did attend this discussion, suggesting he had an afternoon off from his War Office duties on 7 November. The War Office at this time was divided into seven sub-sections of which I believe Lt Col Sir Henry Norris worked in the Department of the Adjutant-General one of the most senior officers in the British Army. From 1916-18 the AG was Lieutenant-General Sir Nevil Macready generally referred to as “Make-Ready” who was among other things the last British military commander in Ireland. He also served for two years as Commissioner of Police in London. Lt Col Sir Henry Norris worked in the last of these. Back in the day to day, on 9 November Sir Henry went to a meeting of the Metropolitan Water Board – another committee on which he had been active before the war, but which was now most of the time squeezed out of his schedule. Sally Davis gives us the reason why he went this time for this was an emergency meeting at which the Board discussed ways of preventing its home – Savoy Court – from falling into the hands of the Air Ministry. It did however eventually fall. The re-election of Sir Henry as mayor – which throughout the war was a formality – took place on 9 November there being no other nominations for the job. It is clear from his speech of acceptance that despite all the advances it had given him in terms of honour and rank, he had very much had enough of the war which he called “disastrous”. And as we have seen it wasn’t doing too much for Arsenal either. The away game with Millwall Athletic on 10 November not only failed to produce a victory but saw another decline in the crowd – this for a match that traditionally brought one of the largest wartime attendances due to the historic rivalry between the two teams, dating back to Arsenal’s days in south London. 6,000 attended and it was a 2-2 draw. It is interesting to note that the following Tuesday, 13 November, Sir Henry was again at the LCC, this time in the full meeting of the council, and after that at a meeting of the War Savings Associations. It is therefore possible that he had, in his normal style looked at the situation he was asked to consider (in this case recruitment in the south east of England), and set up appropriate systems, and was now waiting for his work to be implemented. Meanwhile on 16 November British troops occupied Tel Aviv. On 17 November Arsenal’s severe decline in form was further confirmed with the home defeat to Tottenham by a single goal to nil. The only respite from the gloom was that the crowd was slightly up, at 9000. The following week the issue of Fulham being a one party state arose once again. As we have seen, at the final elections before war broke out, every councillor elected was a member of the Conservative and Unionist Party, something easily explained when one looks at who could vote. Voting had been reformed three times, but the latest reform act (the 1884 Act) still only enfranchised 18% of the adult population. They were all male, and were all middle and upper class. Not surprisingly in some areas the Conservatives won each seat. But the Fulham Chronicle now had the bit between its teeth, and unable to write anything meaningful about the war because of the censorship, it now attacked the council head on, calling it a “wilful and bigoted…junta”, and each councillor as “a toy figure…worked by a string”. (Thanks to Sally Davis for those quotes). Back with the football, on 24 November Arsenal suffered another defeat – this time to Chelsea at Stamford Bridge, 3-4. 5000 were in attendance. The following week Sir Henry was once more to be found at the London County Council meeting, another sign that the urgent work he had been engaged with at the War Office had now reached a temporary pause. The month started a little better in terms of the football with a 4-1 win over Brentford on the 1st. 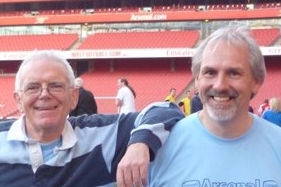 But the crowd was down again – this time only 4000 in Highbury. It now looks as if the War Office work picked up once more as on 5 December Sir Henry missed another LCC Education Committee meeting. And on this occasion the council would have decided as it had done in the past that it was not right that the pay of staff should be discussed in public – after all no one else had their pay open to public scrutiny. Councillors of course were not paid, but employees of the council were and here pay rises for the Town Clerk and his deputy were up for discussion. On 8 December Arsenal continued their losing ways, going down 0-2 to Palace at Highbury with the crowd now sinking to 3,500. The following week saw the Battle of Jerusalem as the Ottoman Empire surrendered the city and the British Egyptian Expeditionary Force took control. Next up on the football front was a game against West Ham on 15 December, but it ended in another defeat: 2-3. 5,000 were present at Upton Park. The following week the Chronicle was told that the council had decided to give their Town Clark a 100 guinea bonus (£105) and his deputy a 50 guinea bonus (£52 10s) to compensate for the additional work that had been taken on during the year. 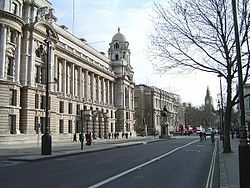 In the coming days there were further meetings of the London County Council and its Education Committee, but Sir Henry attended none of them – seemingly he was now again fully occupied in Horse Guards Avenue (at its junction with Whitehall – the picture above is of course one as the buildings look today) where the War Office was housed. And by this time it was getting particularly cold with some snow. The temperature only reached minus 1.6°C on the 19th, with a minimum below minus 5°C on the following night. And so we entered the traditional Christmas football season, and the results picked up somewhat although to be fair Arsenal were playing modest sides. On 22 December Arsenal beat QPR 3-0 at home. On Christmas Day and Boxing Day it was a 1-1 draw each time against Fulham (away on the 25th, at home on 26th) both games in front of 7000. And then a very poor crowd of 2000 turned up to see Arsenal beat Clapton Orient 2-1 away on 29 December. On the final day of the year Arsenal Football and Athletic Company Limited produced its annual accounts as it was required to. These were now very late (although if anyone in Companies House complained I imagine Sir Henry would have pointed to a certain degree of work at the War Office). In reality many companies produced no accounts in the war, and quite a few simply failed to re-emerge after the war. All debts were put on hold upon the outbreak of war and therefore there was no legal means of enforcing a debt or imposing interest payments. Everyone simply had to wait for the hostilities to end. Finally on the last day of the year the government imposed the rationing of sugar to 8oz per person. Given that everyone had sugar in their tea, this was considered an outrage. Here are the matches for November and December 1917. Four wins, three draws, four defeats. The improvement in late December had made up a little for the earlier part of the month and most of November.